While most drone manufacturers are focusing on making compact quadcopter drones, Parrot is taking a completely different approach. Parrot, known for making one of the first ready to fly drones back in 2011 with the AR.drone and most recently the light, foam Bebop drones, has now created a ready-to-fly fixed-wing drone — the Disco. The $889 Parrot Disco (price reduced from $1,299) is an autonomous fixed-wing plane. It flies just like a plane — moving forward at all times. (That’s in contrast to most drones you would think of which are multicopters — typically four propellers that allow the drone to hover and move in all directions). It can land and take off, maintain altitude and stick to a flight path autonomously. It can fly for up to 45 minutes at a time at 50 miles per hour — and sometimes even longer if you are flying with the wind. Flying into the wind? It can resist windspeed of 24 mph. It has a 1080p camera with 3-axis digital stabilization to get smoother video. Parrot recommends that you have at least two football fields of space to safely operate the drone. And that leads me to my big question with the Parrot Disco. Why would you use it? Four baseball fields = too many potential lamp posts in the way of my flight path. You need A LOT of open space to fly this drone. I flew it over a series of four baseball fields. Even still, my drone crashed when I turned it and it hit a huge stadium light. It’s a fixed wing drone. So, unlike a multicopter, it can’t hover, rise straight up, or navigate into tight spaces. We’ll get back to that later. For now — let me tell you everything that this drone is about. Once in the air, the drone climbs up to altitude (164 feet) on its own. The sensor technology here is super impressive. When the Disco is in the air, the drone flies in “Loiter mode” — basically a 196-foot diameter where it flies in circles until the pilot overrides that by moving the joysticks. (Both the diameter and altitude can be adjusted on the Parrot Freeflight app). This makes it pretty easy to control once you get the hang of it — and it’s quite fun to fly! Something about flying a plane vs. a multicopter has this exhilarating feeling. The structural design of the Parrot Disco is truly incredible. At less than 1.5 pounds, it’s super lightweight. It is made from EPP (expanded Polypropylene) which feels like foam and and is reinforced with carbon tubes. The wings pop on and off super easily. That’s excellent for if (okay, when!) your drone crashes. Rather than the wing breaking, it more than likely will easily pop right off — which means that when you’re ready to fly again, you can pop it back in. This was very brilliant design, and something I hope more drone manufacturers will incorporate to eliminate damaging the drone during crashes. It’s also ideal to have easily removable wings for storage. While the Parrot Disco wingspan is nearly four feet (45 inches), the whole thing can be compacted into a much smaller box for storage. Wingspan! Almost as tall as me. The controller for the Parrot Disco is an update on its former Skycontroller — this time called the Skycontroller 2. The controller allows you to connect to your smartphone with the FreeFlight Pro app, so you can see what the drone’s camera sees in real-time. The Skycontroller 2 range is slightly more than a mile, according to Parrot. Just like most multicopter RC transmitters, the Disco controller has two joysticks — though for multicopter users, they’ll have to get used to the joysticks controlling different flight patterns! 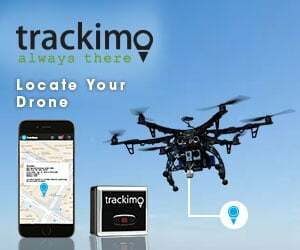 The controller also has features like geofencing (this is software that puts a virtual fence in the air) — useful for making sure your drone doesn’t travel too far away. A neck strap for the controller could have come in handy here. The Disco has a 14 megapixel, HD camera and 32GB of memory. It’s pretty high quality. Check out my YouTube video to see what the video actually comes out looking like. Because of the aforementioned turning radius and need for open space though, you’re going to need to be flying fairly high — over treetops/light posts/other obstructions to fly this, unless you have very precise piloting skills. That means you’re going to get soaring, wide shots from your drone. They are cool, but they also get old. With my multicopters, I’m able to get incredibly precise, tight shots: flying underneath the pier and panning up over the waves, hovering over a uniquely designed fountain and then flying straight up, or following me as I bike along a windy trail. You won’t get any of these shots with the Parrot, which makes me wonder what sort of use case a photographer would have for this drone. I do like that the videos appear instantly in the app on my phone, which means I can upload them instantly to my social networks or text them to friends without having to mess around with uploading the contents of an SD card to my computer. The Parrot Disco drone also comes with a FPV headset, dubbed as “Cockpitglasses”. I love that they also work with the Bebop 2 if you have one! The FPV headset allows you to see what the Disco sees, following the Disco’s flight path with a display of radar and telemetric data. I never used these myself because I wanted to be able to see the drone in my line of sight while controlling it. But, if you had a third person beyond yourself and your spotter, it would be fun for them to be able to wear them and be a part of the drone flight! From an engineering standpoint, this is one of the finest pieces of technology I’ve ever reviewed. The app works wonderfully, and it’s a very cool experience to pilot an unmanned airplane. However, for $889, I cannot understand why someone would buy this, unless they lived on a huge parcel of flat, open land and had a good chunk of disposal income. Flying the drone takes a lot of effort — it’s not something you can zip around your backyard (unless it’s huge). Parrot’s press announcement for this product was at a golf course in Palm Springs — and it makes sense. You are going to need a lot of wide open space. Even a light pole in a baseball stadium could be enough of an obstacle to crash your drone. So if you live in the desert this could be great — otherwise it will be difficult to find a place to fly. The video possibilities are certainly cool, but they won’t provide the versatility of shots if your primarily purpose for getting a drone is photography. And while the drone is relatively easy to fly once you get the hang of it — it is still significantly harder to fly than a multicopter. This drone really is for someone who loves to fly (and not just take pictures). But at that point, I would rather just have a traditional RC plane, which you can buy for a lot cheaper than $889. (Most good quality, FPV RC planes range in price from $100 to $300). While I had so much fun flying this drone for review, I’m not sure what type of customer I would recommend this for purchase. If you have one (or want one!) let me know why in the comments. In the meantime, happy flying! Great article. I think Parrot are looking at the Disco drone to be used as an introductory drone for companies and agriculture which have a lot of land to cover including conservation / environmental projects. Some people are still holding back from buying drones to survey large land areas. The price for the Parrot Disco might just be enough for anyone holding back to jump in. Thanks for the cool review on the latest from Parrot. I kinda chuckled because this drone reminds me what the Army/Marines have used over in Iraq/Afghanistan. No it doesn’t. Overall, they both are flying wings. However The RQ-170 resembles a B-2. ha ha, if i ended up buy this 160 acre land in SLO then i would need this drone to do some patrolling. lol. 🙂 good review. TDG. Hello Sally, I am new to drones and to flying. Also, full disclosure, I just started working at Pix4D in Switzerland. I am reading your blog to help me get up to speed. Thank you. If you are interested in who is using Parrot Disco-Pro (Ag) drones, you might be interested in the winners of our Climate Innovation Grant. From grasslands to lichen to the Arctic, these drones will be helping six researchers move their projects forward and help answer some big climate change questions. You havent flown it long enough. This is a fine Wing. Technology is truly way ahead of most. Parror Discos are fine. You did a Parrot a disservice with yiur review. Wrong! It’s easy to criticize but you didn’t bother to justify your criticisms. Hi TDG. I actually havent gotten a DISCO yet. But it seems like the perfect plane for me. Im looking for a fun yet easy to fly plane with a fpv experience. In australia. The only alternative is to buy a plane, transmitter, goggles, and accessories all separately. DISCO seems to be the only rtf package ive seen. I am not a rc enthusiast and so the thought of building and modding is daunting. I have owned 3x cheap quadrotors and i believe a plane is a different experience. Thank you for your review. To see a nicely dressed woman flying the Disco at baseball field is quite unusual. Let me stress this. Launching and flying the Disco should be easy as long as you stay above the tree, house, stadium light, flag pole etc. The attitude should be at 50 meters or above. I always flew my Disco using Flight Plan or autonomous flight. I always used circular landing. Circular landing can be difficult in windy days when a tailwind can blow my Disco out of its intended flight path. It happened to me a couple of times. However, I love my Disco. A 45 minutes flight time. No qadcopter or fixed wing plane can achieve that; and the price of the Disco keeps on dropping.! Did they stop making the disco ?